My name is Anke and I will be the new intern at the HKDCS for the next two months. Back In Germany I’ve almost finished my Diplom in Biology/Ecology, but I’ve wanted to come to Hong Kong to do cetacean research for a long time now. I’ve already seen dolphins in quite a few rather natural places, but it is fascinating how dolphins actually live in such an urban place like Hong Kong, which for me has always been synonymous with skyscrapers and high ship traffic. It is only natural, that these animals face a high risk of endangerment in such a fast developing and anthropogenic place. 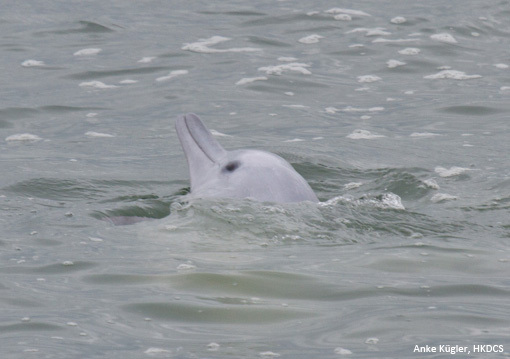 Luckily the HKDCS is doing intensive research in order to protect not only the Chinese white dolphin but also the more elusive finless porpoise, because we still know little about both species. Especially habitat preferences but also behavior could be critically affected by all the human influences. This first week of my stay was full of training and full of rain. During the first three days I’ve been on boats to get introduced to line-transect surveys, which – though I knew the theory – I’ve never done before. It is great to still learn new things after having done quite a bit of cetacean research already. With new projects you always learn so many new things, not only techniques, but also research approaches, new obstacles and – of course – new species. Unfortunately the rain continued for three days straight, it’s still the rainy season after all. 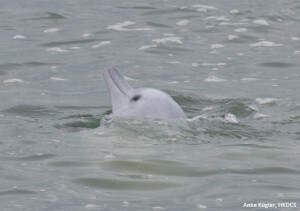 We however still managed to see dolphins – my very first sighting in fact was of two mother-calf pairs, and the calves even did some spy-hopping. 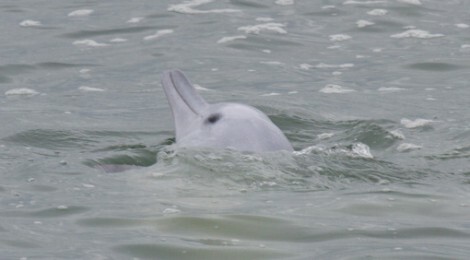 On another day, one dolphin was breaching quite a few times. Dolphins indeed never fail to enlighten me. Funny enough, the other days were the complete opposite: I helped with land-based theodolite-tracking and the sun was burning down on us. Again there was so much to learn. It was really interesting and actually quite shocking to see how much boating of all imaginable sizes is going on, although I’ve been told that the traffic is still comparatively low in this station. I enjoy being both on boats and on land and I know how important the combination of different platforms is. Land-based surveys can at times be challenging because you only see dolphins from far away while putting in long days of work. But they do provide so important information. I’ve also already met quite a few people from the team and couldn’t have faced a nicer welcome. I’m really looking forward to spending the next weeks working with those people, helping with all the different ongoing projects, and contributing my little share to the conservation of those precious animals. I’m sure there will be countless and great experiences laying ahead of me.